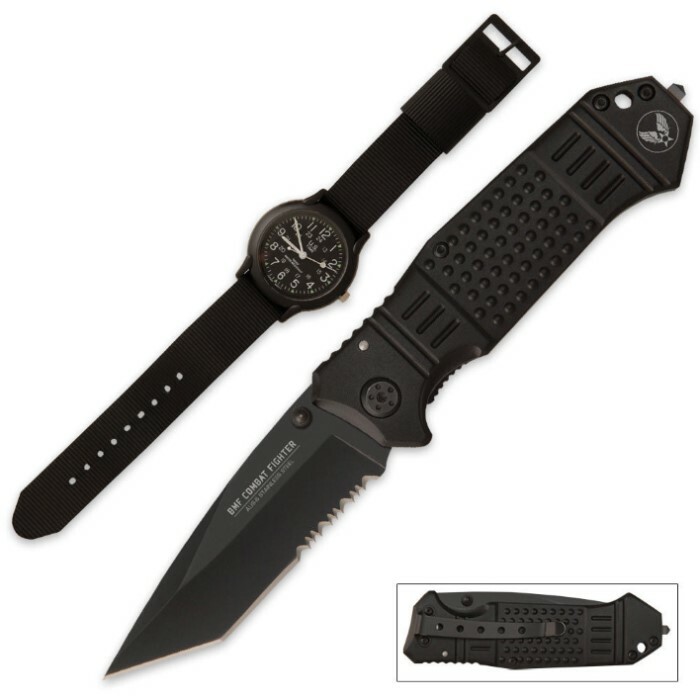 Tactical Pocket Knife and Army Ranger Watch Combo | BUDK.com - Knives & Swords At The Lowest Prices! Whether you're heading to a combat zone or another day at the office, this exclusive new combo set won't let you down! No matter the task at hand or time of day, you'll be prepared with this combo kit! I just got the BMF Combat Fighter and it is a great knife! The 3 1/2" blade is razor sharp and the tanto point will pierce right through 50 gallon drums! I've already busted some windows out of a wrecked humvee with the glass breaker point and the serrated blade sawed through seatbelts like butter! The low-pro pocket clip lets me carry tip down which is faster to open and also safer to keep me from slicing my fingers! On to the watch--> The Ranger watch has a military grade nylon band that I think would rip my arm off before it broke, and the the glow in the dark dials are great for checking the time at night in the tent. Great deal for $20 IMHO. And if I lose either, I'm not out $100! Thanks BUDK!